Fai snorkeling in alcuni dei luoghi più spettacolari di St. Maarten, come Pinel Island, Creole Rock e Tintamarre Island. 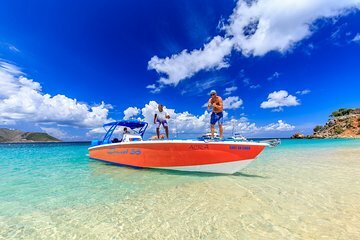 In questa eco-avventura di un'intera giornata con guide esperte di snorkeling, salite a bordo dell'elegante motoscafo e uscite a Simpson Bay. Indossa l'attrezzatura da snorkeling fornita, approfitta della guida esperta dello snorkeling del tuo ospite e salta per nuotare con pesci e tartarughe in 3 punti. Fermati per un pranzo gourmet a Grand Case, poi vai a Long Bay per un po 'di tempo sdraiati sulla spiaggia. Sulla via del ritorno verso terra, fermati a Maho Beach per osservare i jumbo jet che atterrano nel vicino aeroporto. Include l'open bar gratuito a bordo e il trasporto di andata e ritorno dagli hotel St Maarten e dal porto turistico di Bobby. This excursion was one of the best parts of our vacation. Chris and the boat Captain were the best tour guides. I highly recommend this excursion. It was a spectacular day with our Captain Al. Our group was fun to be with and we had a great snorkeling experience. In addition, we had a really nice lunch and swim after. My girlfriend and I had an amazing time. Sean was an excellent guide and made us laugh the entire trip. It was definetly the highlight of our vacation in St Martin. Everything about the trip was terrific!! Richard was fantastic. Helpful, informative and great stories! We had a great time. Didn't get me Billy bones beer holder, but he deserved a great review anyway. Oh, the tour was fun too! It was a very memorable day for my daughter and I. Captain Rick was very funny and informative.The boat ride around the Island was exciting and offered beautiful scenery and the Captain's fascinating narrative on the island's history and description of the significance of what we were seeing. The snorkeling on the two stops we made was great crystal clear water, coral formations, colorful tropical fish and green turtles. Our stop on Pinell Isle allowed us to see the native Iguanas and the nice beach bar/restaurants there. Definitely worth the price! I would highly recommend it to anyone visiting St.Martin/St.Maarten. Our family of 4 including our almost 16 and 17 year old daughters loved this snorkeling adventure. A true highlight of our cruise to the caribbean. Our captain Kevin and first-mate Chris made this charter an unforgettable experience! If we can get back to St. Maarten we would do this charter again in a minute! THERE WAS NO BATHROOM. THE LADDER LEADING FOM WATER TO BOAT WAS BROKEN MAKING IT HARD TO GET ON THE BOAT. THE GOURMET LUNCH WAS A HAMBURGER AT A BEACH BAR. THERE WERE FISH BUT NOT LIKE SWIMMING IN AN AQUARIUM. THERE WERE NOT ENOUGH LIFE JACKETS SO MANY HAD TO SWIM WITH A TUBE NOODLE. THERE WERE NO SNACKS AND THE OPEN BAR CONSISTED OF A BOTTLE OF LOCAL RUM PUNCH. I WOULD NOT RECOMMEND THIS TRIP ESPECIALLY GIVEN THE COST. Amazing day on the water with Russell. With 2 snorkeling stops, a great lunch at Rainbows, and an awesome tour of the island this was one of the highlights of our trip. The Rum Punch was strong, drinks were plentiful, boat was fast, captain entertaining an knowledgeable. Snorkeling was a blast, saw all kinds of fish at Creole rock, and followed a turtle and spotted ray around at Tintamarre Island. The stop off at Pinel was a nice break in the middle to hang out in the water and go feed the indigenous iguanas on the island. Finished the trip with a water tour of the rich and famous of St. Martin and concluded the trip watching planes land at Princess Juliana airport. I would highly recommend this to anyone who enjoys being on the water and would like a different perspective of the island. Since we had a full boat it was up to Russell to provide entertainment, history and fun all while captaining the boat. He did an amazing job and would recommend him to anyone for a great day on the water. Billy Bones Boatcharters is fantastic. Balasz, the owner, really makes you feel like family. He will pick you up anywhere you are staying. Captain Jim was great. He makes sure you are having a great time. We loved it so much, we booked 2 trips with them. I would definitely recommend them to anyone wanting to do a boat trip and snorkeling.